Ryuji Higurashi, one of Capcom's main illustrators who has worked on various Mega Man titles over the years, was interviewed by Rockman Unity about his involvement in his "Supervisor" role when working with Sentinel Mega Man figures. The interviews go pretty in depth about the figure design process, what difficulties there were, and some potential news on the future of the lineup! Check out the highlights from the interview after the jump! Before you read on please note: this interview was conducted between Ucchy (Rockman Unity) and Higurashi. 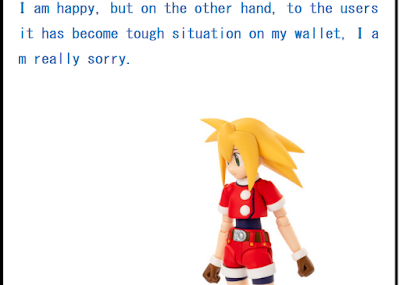 Although Higurashi contributes greatly to the development of Sentinel's Mega Man figures, his comments don't necessarily reflect the company's views. Now, let's jump into some highlights! When the Sentinel line of figures were being planned, Higurashi was given a "supervisor" role. In the interview Higurashi explains what this involves. 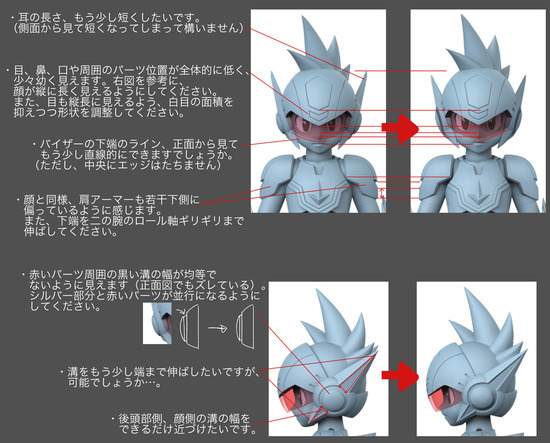 The brief given to him for the 4 Inch NEL series from Mr Kitamoto of Sentinel was "figures that thoroughly reproduced the official illustrations"
Supervision on merchandise projects basically means making sure the figures look as close as possible to the original source material, while also considering the range, pricing etc. Levels of supervision differ depending on the product in question, for example, a figure that costs 500 Yen ($5) isn't going to get the same level of scrutiny, attention to detail & time spent making it look perfect as say a figure that costs 10,000 Yen ($89) as it costs to make adjustments to figures it could eat into profits if too many changes are made to say a $5 figure. Higurashi had performed a similar role on the X-Plus series of figures previously & is also a huge toy fan so while he found some aspects of this job difficult he still enjoyed it. He states that the Sentinel line is probably his favorite so far & personally owns a few pieces from the lineup himself. Higurashi explains that he usually has to submit a 3 sided illustration for a character to Sentinel as shown below, he states that it also makes them happier if the color codes for them are included too. Higurashi did find this difficult however & says the hardest thing about supervision was that he wasn't the original author of the design material, since he started his involvement with Rockman with the EXE series but didn't design any characters himself until after that. Toy companies usually say "it's the responsibility of the original author to convey the correct answer" with regards to how the character looks in figure form so this was challenging for him. Seems Higurashi would also like to see more Starforce figures! Another difficulty with Shooting Star Rockman was the visor, making the visor into a solid object was a challenge as in the illustrations of course it's always flat, luckily Keiji Ueda from the Star Force team had a 3D model to help with the production. 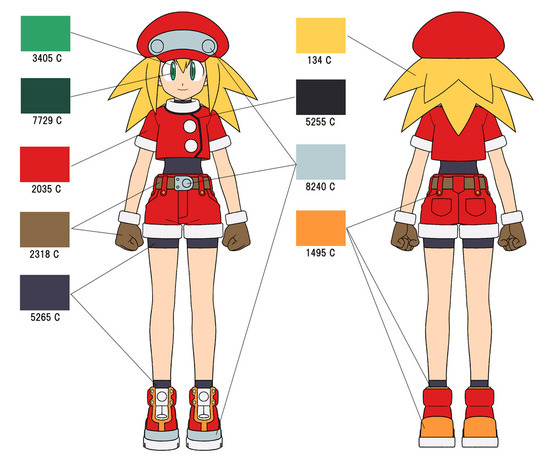 Another figure that posed a challenge was Mega Man Volnutt as Higurashi states the designs in the illustrations change, for example in some of the earlier art Volnutt is shown with the tops of his feet being rounded rather than square as shown in later illustrations, he goes on to say the same happens with things like the color of Tron Bonne's dress etc. He also talks about the decisions involved with the Mega Man X NEL figure, since X has many different designs throughout the series it was difficult to decide which to choose. In the end they decided that since Mega Man X1 & Mega Man X2 were the most popular & were the best sellers they went with that design. They included the magnets in the feet so not only could you re-create the iconic wall cling pose but it also meant that the figure had a unique selling point & something that other previous Mega Man X figures didn't have. 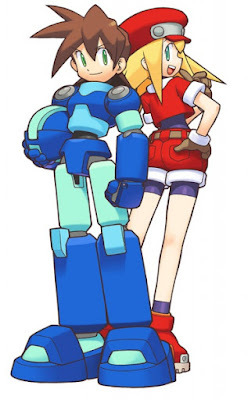 Higurashi also mentions that it is possible that a Mega Man X4 - Mega Man X7 design figure for X & also a "main illustration" version of Mega Man.EXE could be a possibility in the future! Higurashi explains in the interview why there are 2 variants for the Roll Caskett NEL. Originally it was only going to be the one figure, Higurashi wanted her to have a head option without the hat as well as Data included. However he was busy with the development of Mega Man 11 & still needed to draw a 3 sided illustration of Data for Sentinel to use. By the time the proposal was put forward for these 2 parts the figure had progressed to the point where they could no longer change the price or content. So the decision was made to make a limited edition figure instead. He apologizes to the customers as while he's happy he got to have both versions make it to retail it is a tough decision on the wallet. Future of the line & what about other characters? 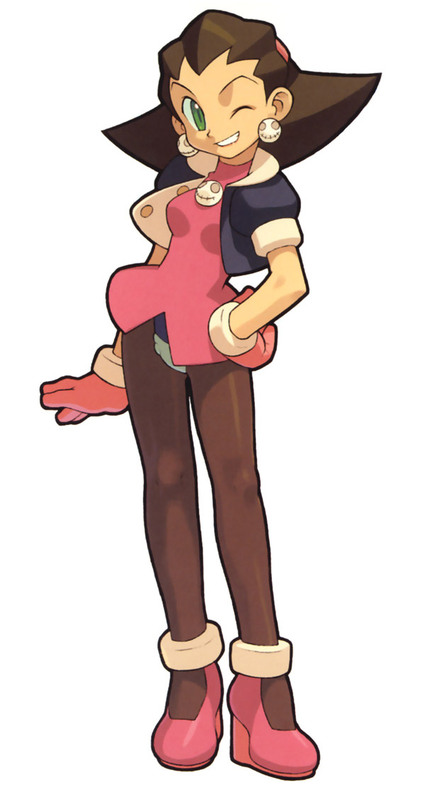 This is the big one, Higurashi reveals in the interview that originally the 1st female character that was going to be made for the lineup was none other than Tron Bonne! He had even done the 3 sided illustrations for her. However as Higurashi says, Tron already has her own game, has had appearances in many crossover titles & already has various figures & statues over the years. Whereas Roll Caskett has only ever had the Tomy Yujin Capsule figure of her & yet she's supposed to be the main heroine of the Legends series. So Higurashi himself pushed for Roll to be the next figure in the lineup. 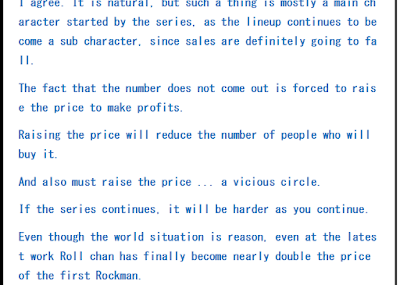 He does say though that if sales for the Roll Caskett NEL are good then the possibility of Tron Bonne being the next figure is "extremely high". He also goes on to say that because he personally wished for Roll he's personally ordered 3 of each variant to help support the release. So what about Robot Masters? Or other minor characters in the future? Well Higurashi goes on to explain the pitfalls of doing this. He notes that the figure industry is in a tough situation as prices keep rising. Up until now the majority of the figures in the NEL line have been main characters. If the line continues & they keep going down the sub character route sales will definitely fall & since the figure manufacturers know this they have to increase the price to make up for it. Problem is if they increase the price not as many people are willing to spend so much on a figure so it is a vicious cycle. 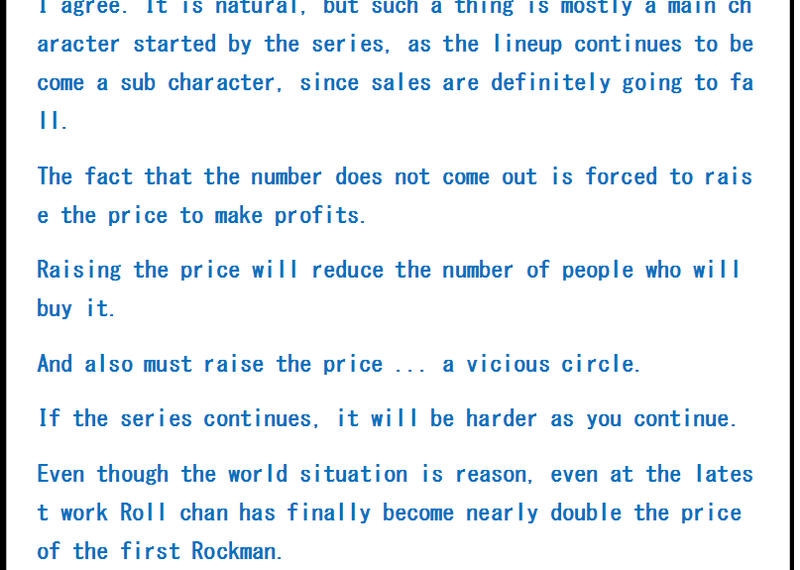 If the series is to continue it's going to get harder, as Higurashi says you can already see this if you look at the price of Roll Caskett's NEL it's nearly double what the Classic Rockman NEL price was on release. As Higurashi puts it "Adventure of a business & difficult to know the result"
So if you want to see more Sentinel figures it looks like they'll need our support, personally i'd love to see a Tron Bonne NEL figure released! Who would you like to potentially see down the line? You can check out the full interviews here & here although you will need to use a translator or be able to read Japanese. This is a good man, right here best of luck to the line and it's future. Hopefully they release a protoman figure! This is a fascinating interview, and it helps to lessen my disappointment with the way the Roll figure was handled. I mean, in an ideal world, it would've been the one figure, but I certainly understand how things ended up the way they did. I think a series like Legends would do better in the supporting character market than pretty much any other Mega Man series. Legends is obscure among most people, but a fair portion of Mega Man fans have cited it as having some of the best characters in the franchise. Tron and Teisel are considered the highlights of the series, to the point where they pretty much surpass Mega Man as the faces of it, so I think their figures would still do well. For X, Sigma would probably do well...maybe Alia...of course, Zero and possibly Vile. Unfortunately, I think the only other series besides those two where supporting characters could see any profit would be Battle Network. But then again, if a character as somewhat mocked as Roll Caskett does well, then I suppose the market will turn out to be a more unpredictable place than I'm giving it credit for. While I don't see megamix versions coming out even when they did the cutman reference, I would love to see the x8 designs made. 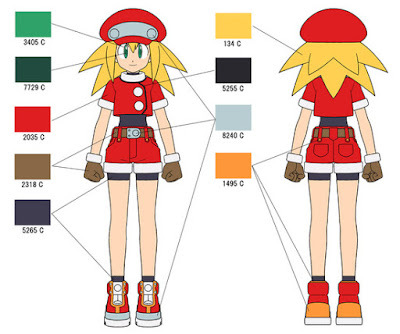 Especially, since that zero hairstyle is probably my favorite there then the more bushy design. The X8 designs are the BEST designs next to Ver.Ke. I would also love to see the X8 designs. As far as games go, i think how well MM11 sell is going to be the turning point of everything. If that'll be the case, then we'll most likely have good news as MM11 is a hit. I think it was hinted that we'll get a MMX9 in the Legacy Collection so I guess we'll get that before we get a MML3. Really happy with the transparency being shown here, especially when it came to the 2 Roll Caskett figures debacle. if Roll Caskett managed to do well, maybe Iris would. Alia too, but it seem like Iris is more popular among japanese audiences. 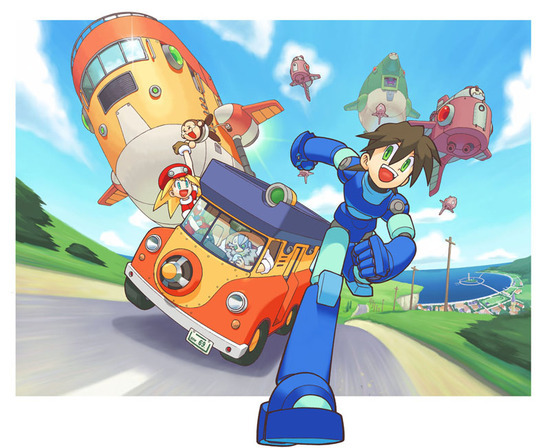 I want to see Mega Man Legends 3 and Tron Bonne 2/Tron ni Kobun 2. I'm pretty sure that's not how supply & demand works. Its how business works. The big wigs in charge of the company that makes these don't want to lose money. If they start to lose money all incentive to continue is gone. It stinks but that's how it works in this world. Why would they put so much effort in a Roll (not even classic) and not a Protoman or Bass? You could get away with two different Protomans. One could be Break Man. Not seeing much logic in their choices. Maybe another company has exclusive rights? 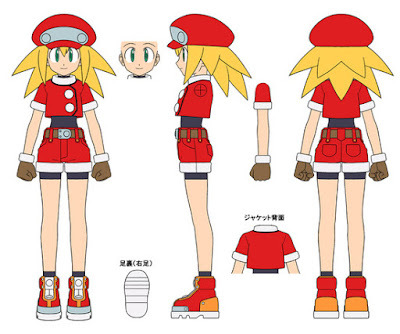 Bandai made protoman, zero, bass and classic roll I believe, so maybe thats it. Cause legends roll gets no love but, there are many protoman/breakman items. Let the side characters get a little spotlight. This seems in a way encouraging but also discouraging. I will continue to support these figures, which are on my opinion the best line of mega man figures to date. Hopefully tron bone happens, and comes with a servbot or two. They are worried about sales w minor characters and they make Roll from Legends? 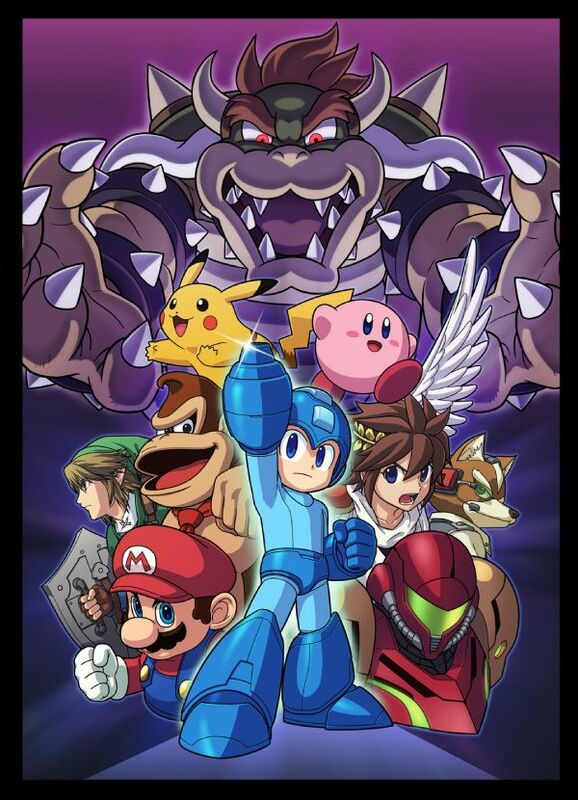 Why not make Proto-Man, Zero, Vile, Bass, Rush. Classic and X series are the most popular series, these characters are much more visually interesting and would make better figures than Legends Roll. Also, prices have gone up a little with other figure lines but not even close to the level for the Roll figure. I bought one cause I love the figures and to support the line but they are making bad choices. The last three figures are Starforce, that ugly 30th Anv figure and Legends Roll that's a line killing lineup. Megaman 11 is almost out and interest/nostalgia for classic Mega Man will be at its highest, they should be focusing on that. I think alot of fans love the more obscure type of choices, myself included. They should do more bundles of minor characters with popular ones like the cutman bundle. I know people like to complain about it but I'm sure they sold well. They do a robot master and a megaman with a recolor matching the power up he gets from the boss or uses against it. Idk just a thought, but I think they are underestimating those kind of characters. People will buy them if they never had a good figure before. Now I'm GLAD I pre-ordered both Roll figures. This man clearly loves his job and the end results of these figures show this. I'll DEFINITELY keep continuing to support this line, especially if Tron Bonne gets made. Black Ace Megaman from Starforce 3! ...It's not well recognized enough for them to do it but, god I would love it if they did. Black Ace Megaman from Starforce 3 or Axl. ...They're not well recognized enough for them to do it but, god I would love it if they did.